Keyword Assistant is a plugin for iPhoto to make keyword management easier. The main feature, pictured at right, is an auto-completing text field for assigning keywords. This is much faster than using the built-in keyword panel. For more information, including why either keywords or Keyword Assistant are a good thing, take a look at the ReadMe. This version requires iPhoto 4.0.3 - iPhoto 6.0.6 and Mac OS X 10.4. It runs natively on Intel- and PowerPC-based computers. See the changelog for what's new. Keyword Assistant does not support iPhoto '08 and I have no plans to support it in the future. 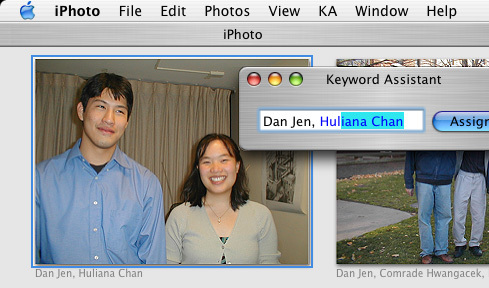 In iPhoto '08, the native keyword interface is good enough that Keyword Assistant is not necessary! Yay! Keyword Assistant is currently localized for English, Danish, Dutch, French, German, Italian, Spanish, Swedish and Russian. Send me an email if you'd like to help with a localization. Typing a few characters selects a matching message. ^↓ and ^↑ select next and previous match. Source for this plugin is available further down the page. Note: Upgrading from Mac OS X 10.4 to Mac OS X 10.4.1 will disable this and all other Mail plugins. To reenable Mail Type Select, follow the directions in the ReadMe. Gmail's Contact Import interface (June 18, 2004). AddressBookToCSV is a one trick pony whose purpose in (artificial) life is to export contacts from the Mac OS X Address Book to a form gmail can import. That form is called CSV, a comma separated value format. If you want anything more from it, well, you've got the source (or you can ask me). PadCaster is a command line tool that converts MacPAD application description files to RSS 2.0 feeds. A MacPAD file describes one application; it contains the same information as is found in a versiontracker posting. Thus, the feed PadCaster produces provides RSS software update notifications. Fraser Speirs coined the term Appcast for such feed. For developers, this is a convenient way to offer an RSS update feed for your software. For users, this lets you create and subscribe to RSS feeds for applications that support MacPAD. This requires an aggregator that can use scripts as feeds, such as the excellent NetNewsWire 2. Version 2 is greatly expanded in scope from version 1. We now translate all types that cocoa scripting knows how to handle (though independently of the unexposed built in functions). Also, the mechanism is now extensible. You can fairly easily set up your own objects (or other ObjC/AS objects) for automatic translation to and from applescript. Typing a few characters selects a matching table row. ^↓ and ^↑ and select next and previous match. This is the class that powers the MailTypeSelect plugin, and the project includes the source for that plugin. There are a few other example targets, including one that adds type-select to all table views system-wide. BSD license. This class might also be of interest because it is pretty much a complete re-implementation of NSSplitView with an open source license. It's a good place to start if you're looking to add some functionality to NSSplitView and you're having a hard time getting it by subclassing Apple's class. The latest version has better position saving, fixes a few bugs and tiles subviews more accurately than NSSplitView. See the changelog for details. This is extremely useful during the exploration and debugging stages of development. By building or modifying objects dynamically, it's possible to avoid the compilation stage until you have a decent idea of what code you'd like to implement. The header file contains documentation and examples. KFDecorator requires FScript and is released under a modified BSD license. The F-Script project contains within it an application called F-Script Anywhere. This application allows one to add the F-Script framework into any Cocoa application without altering the application itself, along with enough UI to be able to create an interpreter or object browser within the running application. This is extremely useful as a development tool when used with one's own application, or as an educational tool for exploring the makeup of any Cocoa application. F-Script Anywhere was not always part of the standard F-Script distribution. It was originally written by Nicholas Riley, and unfortunately the original method used for injection into a running app stopped working in Mac OS X 10.3. I wrote a quick and dirty temporary fork, called F-Script Anywhere SIMBL, that worked well on 10.3 and 10.4 while Nicholas was working on a reimplementation of the original to use mach_star as the mechanism for injection. Since Nicholas (and Robert Chin) finished their good works and the application has been added to main F-Script project, this distribution is no longer necessary. But! For anyone who wants it, it's still here. I'm no longer maintaining it - I recommend the official distribution. Download and install the F-Script framework (that means copy the framework into /Library/Frameworks/ or ~/Library/Frameworks/). Download the FScriptAnywhereSIMBL disk image. Copy SIMBL to ~/Library/InputManagers/, creating that folder first if necessary. Copy FScriptAnywhereSIMBL.bundle to ~/Library/Application Support/SIMBL/Plugins/, creating all the necessary intervening directories. Now restart the applications you're interested in. If you've succeeded in loading the bundle into an application, that application will have an FSA menu. The * character is special, and if you use it as an entry in the SIMBLApplicationIdentifier array then the bundle will load into all cocoa applications. For documentation not covered here, please see the F-Script project for information concerning F-Script and F-Script Anywhere, and SIMBL for information related to SIMBL. Also, be sure to check out the F-Script mailing list. All code is licensed under this Creative Commons license unless otherwise noted. If you'd like to use something on this page but can't because of licensing issues, email me. If you have any bugs to report definitely email me. Same goes for feature requests and general questions. You can reach me at kenferry at the domain mac.com.